Discover a secret Eden in Madeira and the story of a precious vine brought back to life. 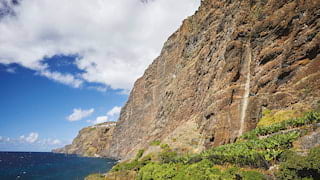 WHEN, IN 1595, a group of Jesuit priests were given a small stretch of land tucked under a towering cliff on Madeira’s south coast, little did they know the impact their actions would have. Now, guests of Belmond Reid’s Palace can take a breathtaking cable car ride down to discover the delicious secrets of this hidden Eden. The priests discovered the volcanic soil was incredibly fertile and set about planting Malvasia vines. Malvasia Candida had been introduced to Madeira in the 15th century when Prince Henry the Navigator—the Portuguese prince who instigated the Age of Discovery—wished to make a sweet wine that could compete with that of Venice. Malvasia is a famously pernickety grape. It likes a low altitude, tons of sunlight and a sheltered position. So this spit of land just above sea level, protected by the towering Cabo Girão cliff and with a unique microclimate was perfect. It came to be called Fajã dos Padres, after the priests. The fortified malmsey wine they produced was heavenly. In fact, it was so good there were soon ripples of displeasure across the island as the holy men were accused of monopolising the market. By the 18th century, the Portuguese government had had enough; the Jesuits were expelled and all their property auctioned off. One might say the viticultural disasters suffered by ensuing owners—most drastically the phylloxera epidemic of the 1870s—were divine retribution. By some miracle, however, one Malvasia vine survived. When a fisherman, who’d long admired the fertile patch from the water, discovered the land was up for sale, he leapt at the chance to buy it. He correctly identified the languishing vine as Malvasia and set about reviving it. Today, Fajã dos Padres still belongs to the Vilhena de Mendonça family and Catarina, Isabel and Isabel’s husband Mário continue the great work, even producing a single-vineyard malmsey on site. The legendary Fajã dos Padres wine is alive and well—and you’re exclusively invited to sample it. On an excursion from the hotel you’ll have the chance to meet the owners, tour the winery and enjoy a private tasting of the luscious wine. The journey down the cliff in a cable car, threading your way through the organic gardens at the bottom, is an experience in itself. Feast on local specialities such as Bolo de Caco—a traditional sweet-potato garlic bread—battered black scabbardfish and fried banana.